An EU leader saying that he or she is in favour of “more Europe” in response to the Eurozone crisis means absolutely nothing. Ask Germans whether they’re in favour of more Europe, meaning codification of Bundesbank-style fiscal discipline at the EU level, using the EU institutions to enforce it, and naturally they will nod approvingly. Ask them if they want joint EU borrowing or backstops for banks, and support for “more Europe” evaporates. Shock horror, in countries more prone to tax and spend – and here we include France – the trend is pretty much reversed. The key to understanding the next step in the Eurozone crisis therefore comes down to one thing: sequencing. The Germans want surveillance before solidarity (code word for more cash on the table). The French the opposite. Which is why it’s not surprising that Angela Merkel and Hollande are clashing over the former’s idea to stick an EU veto on national budgets (her finance minister has proposed a fiscal tsar, sitting in the EU commission, to do the job). Merkel says she wants “genuine powers to clamp down on national budgets…that we stick up for this won’t change”. Translation: if you want our credit rating, you need to accept our Ordnungspolitik. 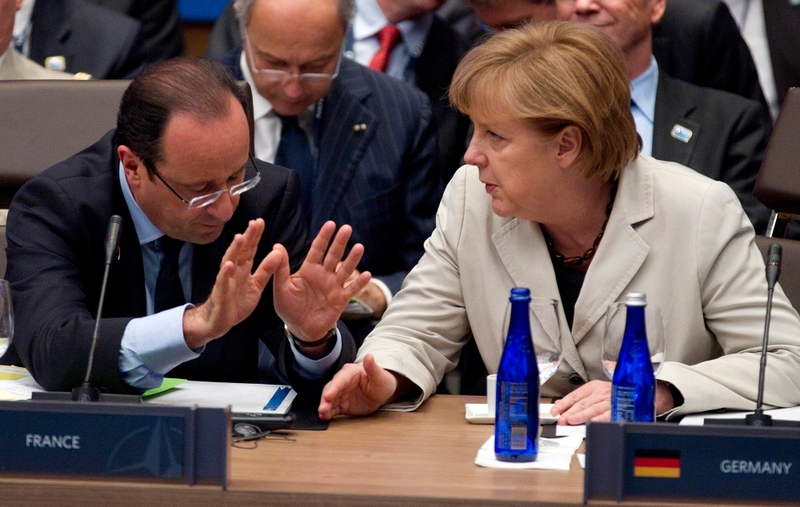 For his part, Hollande stresses intégration solidaire - ‘integration with solidarity’. Translation: cash first, budget vetoes later (sort of). We’ve made this point several times before, but it keeps on reasserting itself. The see-you-in-court fiscal controls that the Germans need as political cover (and as a safeguard against moral hazard) to press ahead with transfers are incredibly difficult to achieve politically, as they effectively mean redefining national democracy in debtor states (key decisions on spending and taxation would no longer ultimately be subject to decisions in national parliaments). The question is what the absolute minimum level of fiscal control the Germans can accept to press ahead with the next step. This is why Herman Van Rompuy's proposal for a contract-style agreement between an individual country and an EU institution, resting on a paid-in insurance scheme (of sorts), could be an interesting to watch. If sold as "temporary" (which of course it may not be at all) and linked to reforms, that might be easier for Germany to swallow. 1. Merkel is 100% a politician. She would love to go into the history books as the saviour of the Euro, but the next best thing is getting reelected. What she certainly doesnot want is been sent home next year. 2. She also doesnot want to be seen as the one taking bold decisions or harsh decisions. She would rather if necessary have someone else pull the plug out of Greece or the Euro. 3. Anyway the decisionmaking process in Germany is moving rapidly to 'voter decide' as elections come close. 4. Point 3 simply means that there is hardly any room left as the ordianry German hate paying for things that have gone wrong abroad. And close to an election it is not likely that spending a lot of German taxpayer money will be forgotten at election day. 5. Which makes it a Catch22. Merkel cannot really actively support any rescue. She probably is happy with the ECB but likely if this means that real money will be spent to buy PIIGS bonds she will have to distance herself more and more (more unpopular and getting closer and closer to the election). On the other hand very unlikely that some decisions can wait till end 2013 and probably early 2014 (with all sorts of approvals necessary). 6. She very likely will go only one time back to German parliament with a package, that will have to work for say at least one year. Preferably asap. If packaging works is a ?. most of the problem countries look pretty unorganised. 7. Banking Union is basically too complicated to arrange before that time. Plus election donot see that happen likely start somewhere around 1/1/2015. Therefor useless as rescue mechanism. 8. Which means saving banks directly is highly unlikely. Simply cannot be sold anyway politically up North. 9. Rompy is a complete idiot imho. And I am sure Christina agrees with me. An own budget has been a no-go now for 5-6 times. In his proposal it is not very relevant still he brings it up again. If he really wants a proper chance of success that should have been kept out. Also as OE suggests make the supervision temporary and for countries in difficulties. And a few other things. The EU is simply too keen on getting an own budget/tax-revenue that this is apparently more important than having something that might actually work and is acceptable for the countries. Simply a very poor piece of work and an absolutely lousy strategy to solve the crisis. Creditors want to know that the money they lend would be paid back and if parliaments passed budgets were it looked likely that the money would not be paid then no further loans would be given. Creditors want to know that the money they lend would be paid back and if parliaments passed budgets were it looked likely that the money would not be paid back then no further loans would be given. Both in the past and now it is all about creditworthiness and whether or not the decisions of parliaments are seen as likely to generate repayment of borrowed funds. The banking crisis is due to money being lent to people without bankers bothering to check what the money was to be used for. Is governments now seriously considering doing the exact same thing while believing the result will be different? If so, on what grounds? Hubris? To elaborate a bit more on the starting date for the bankingunion. Starting in 2013 is highly unlikely and for the following reasons. 1. They went for all banks. Which is logical btw systemic problems have arisen as much in groups of small banks as in the large ones. But: this means 6000 banks have to be supervised of which 5000 will have 1/1 as Balance date. You need to have somewhat of standardised info to be able to do that. Having 5000 or so banks of which a substantial part that are now not able to give relevant data doing so is completely illusory. Simply impossible to do. So 99% sure it will be per a 1/1. The one percent remaining if the EU officials dealing with it fall out of a window of say the 20th floor and hit the surface with the part of their body where with normal people the brain is located. 2. It is not their call. Two important issues to be decided how to place non-Euro countries in this framework and if this is a 17 or EU show. 3. To start with the latter. It is an EU show. You cannot have have doubts about the legality of things. Especially if the contras will use that to block it. So EU27 stuff whether you like it or not. 4. On the other issue, I haven't got a clue, except for the fact that it is nearly 100% sure that Mr Cameron will not give up powers the UK has vis-a-vis the City. Not even to mention using it as contra-blackmail tool if there would be a very 'legal' approach re an UK reneg from the other side (aka the original blackmail). Summarised: I havenot got a clue, but 'Merde' has even less than that. 5. Starting from there 1/1 2013 is impossible (also as Germany needs to approve it by legislation and likely some Constitutional Court hobbyist will use the occasion for a trip to Karlsruhe. 6. During 2013 is not going to happen as it is impossible to control 6000 banks without some system in the data necessary for that (plus a truck load of other practicalities). 7. First possible day 1/1/2014 or as said earlier 1/1/2015. 8. With seen the fact the the UKs position has to be determined the latter considerably more likely. Not even to mention the sept 2013 German election. Which will make anything remotely smelling of German taxpayers having to pay for dodgy Southern banks even more and more unlikely the closer that date gets. Also not even to mention the fact that the largest opposition party said it is a nogo and Merkel needs an own majority (hardly an incentive either). Doubt she is going for that with a substantial chance that she will be dropped as the present coalition partner and the CSU need to profile themselves as well for the election (plus heavy opposition in her own party anyway). After the election a coalition between SPD and CDU is by far the most likely , but also there the SPD agreeing on baking bail outs especially abroad is not very likely. 9. Overall summarised. Most likley we will see a complete watered down bankingunion 1/1/2014 or more likely 1/1/2015 or the whole plan will be DOA. Anyway hardly useful in solving this crisis and again a lot of time waisted.